The PathScan Enabler 5 is the latest version of the patented PathScan series digital slide scanners. The original PathScan Enabler helped create the market for personal digital slide scanning over 20 years ago. With the new intuitive design, the PathScan Enabler 5 allows scanning of whole mounted histological samples attached to standard 1 X 3 inch cover slipped glass slides. The new optional GEOLOGICAL POLARIZING holder allows scanning of polished rock thin sections attached to 1 X 2 inch glass slides in both brightfield and polarized light! The PathScan Enabler 5 solves low power, large field of view, and high resolution imaging problems. Scan area is 24.3 x 36.5 mm, resulting in stunning, incredible images up to 14,320 x 9,522 pixels! The PathScan Enabler 5 holds two (2) 1 X 3 inch glass slides and includes simple to use software for both Windows and Mac computers. The GEOLOGICAL POLARIZING holder accepts one (1) 1 x 2 inch glass slide. Image files are saved in TIFF or JPEG formats. The PathScan Enabler 5 is designed not to replace but complement a microscope and digital camera. The entire sample is scanned with an even, clear background and makes a perfect OVERVIEW image that can be viewed in a variety of software programs. Image scans are equivalent to 40X microscope resolution. Now in its 20th year of production, thousands are in use! 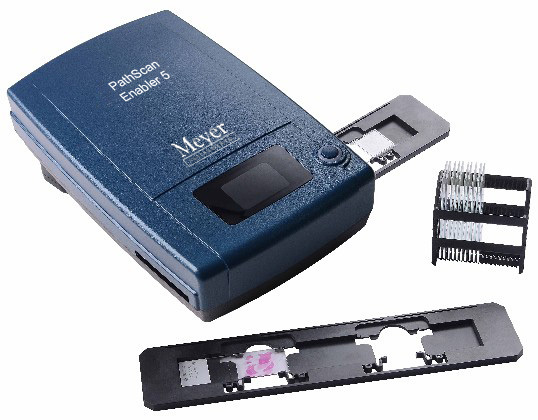 PathScan Enabler 5 is the ORIGINAL low cost Pathology and Geology Slide Scanner, developed and designed by Meyer Instruments, Inc. Don’t be fooled by imitations or copies! Contact your dealer or sales representative for a more details.